I am a DSA Approved Driving Instructor (ADI) offering 1 or 2 hour Driving lessons, Intensive Courses, Block Bookings discounts, Pass Plus, Motorway Driving Tuition Driving Lessons are carried out in our VW Golf 1.9 TDi SE or other quality cars with Dual Controls. All instructors giving Driving lessons are fully CRB checked and hold NVQ Level 3 in Driving Instruction as well as holding Fleet Training qualifications. Driving lessons are given in the following locations: BH1, BH10, BH11, BH12, BH2, BH22, BH23, BH24, BH25, BH3, BH31, BH4, BH5, BH6, BH7, BH8, BH9, SO41, Bransgore, Walkford, New Milton, Highcliffe, Mudeford, Burton, Winkton, Sopley, Crow, Burley, Ringwood, Hinton, Somerford, Ashley, Barton-on-sea, Milford-on-sea, Lymington, Hordle, Sway, Tiptoe, Bashley, Neacroft, North Poulner, St.Leonards, Verwood, Ashley Heath, West Moors, Hightown, Hangersley, Shobley, Forest Corner, Bagnum, Avon, Avon Castle, Ripley, Bockhampton, Purewell, Christchurch, Tuckton, Iford, Hengistbury Head, Jumpers, St Catherines Hill, Southbourne, Pokesdown, Charminster, Winton, Moordown, Kinson, West Parley, Stapehill, Longham, Ferndown, Hampreston, Boscombe, Bournemouth, Talbot Woods, Littledown, Everton, Downton, Pennington, Keyhaven, Throop, Moordown, East Howe, West Howe, Turbary Common, Dudsbury, Redhill Park, Ensbury Park. 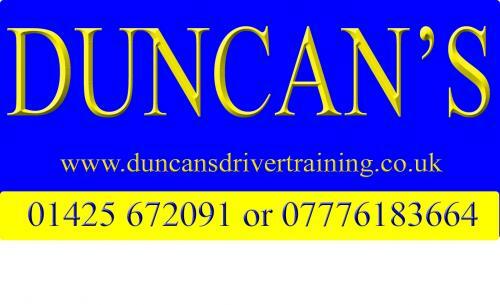 Duncan's Driver Training's patient, friendly instructors offer 1 or 2 hour Driving lessons from DSA Approved Driving Instructors (ADI's) Driving Lessons are carried out in our VW Golf 1.9 TDi SE or other quality cars with Dual Controls. All instructors giving Driving lessons are fully CRB checked and hold NVQ Level 3 in Driving Instruction as well as holding Fleet Training qualifications.